Commonly, farmers till their land before sowing seeds to loosen and aerate the soil and destroy weeds. Tillage, especially the use of a plough, helps to break up heavy clay soils. However, for many soils which are prone to erosion or drought, as are common in sub-Saharan Africa, tilling can harm soil structure and increase water loss. Conservation agriculture (CA) is an integrated system of soil, water and biological management that works to build natural capital, such as healthy soil, by combining agroecological practices such as no-till, crop rotations and cover crops with the prudent use of inputs, where necessary. CA is characterised by three linked principles. Zero/minimal till requires that farmers use hoes to make planting holes or ox-drawn or tractor-drawn drills to plant seeds directly into the soil. Crop residues or cover crops are left on fields to provide permanent organic soil cover. Ground cover of less than 30% does not qualify as CA. Finally rotating crops of different root depths, and rotating with legumes, ensures that organic matter is placed in different soil strata, thereby making the soil more fertile. CA simultaneously promotes the conservation of ‎natural capital and increases agricultural production by improving the growth conditions for crops. CA can act as a good basis for Sustainable Intensification by improving input use efficiency, increasing farm income and protecting the natural resource base, especially when complemented with the use of quality or ‎improved seeds, agroforestry, water conservation, fertiliser microdosing and integrated pest management (IPM). CA also has the potential for combination with other systems for improved productivity and sustainability, such as crop-livestock integration and the integration of trees or pastures into agricultural landscapes. 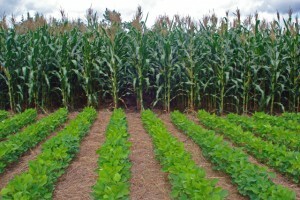 A meta-analysis by the Research Program on Climate Change, Agriculture and Food Security (CCAFS) found that reduced or no-tillage without mulch or crop rotation leads to lower yields compared to conventional agriculture. In contrast, yields were higher overall in no-tillage treatments compared to conventional tillage-based practices when mulch was applied regardless of crop rotations. For farmers to gain the maximum benefit from CA, crop rotation should be an integral component of their farming practice, which implies a change from mono-cropping systems towards systems that embrace diversification, preferably with legumes. Growing legumes and rotating crops may prove challenging for smallholder farmers in sub-Saharan Africa because legumes or other non-cereal crops often gain limited interest beyond household consumption, as markets for sale can be limited. Fertiliser application with dung, organic matter or inorganic compounds is also important for the successful implementation of CA. Where it can be hard to source or to afford adequate organic fertiliser, the use of targeted, non-organic fertiliser may be preferable to smallholder farmers. Crops respond well to CA with high nitrogen fertiliser application, and less so with low nitrogen fertilisation. To increase the crop’s growth response rate, CA should be combined with the selective and targeted use of inputs as opposed to the more expensive and damaging practice of broadcasting inorganic fertilisers. Control of soil erosion is perhaps the clearest benefit of CA, especially on steep slopes and on highly eroded soils. When using mulch alone, however, other measures such as contour bunds may be needed to reduce soil erosion. 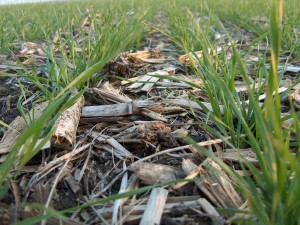 No-till farming is reported to improve soil structure and root structure, facilitating the roots’ ability to absorb water. In arid or semi-arid regions, this enables the recharge of groundwater resources and decreases water pollution through reduced erosion and leaching. However, under humid or poorly drained soils, it can cause waterlogging resulting in a loss of yields. No-till farming combined with mulching has led to the accumulation of soil organic matter (SOM), also important for water retention in the soil. This is especially true in finer soils, due to a lack of protection of SOM. One farmer practicing CA in KwaZulu Natal, South Africa found that his field could absorb water at up to 20mm per hour, whereas fields under conventional tillage could only absorb 4mm-5mm per hour before run-off occurred. Higher levels of SOM also allow the soil to retain nutrients – improving the effectiveness of applied fertilisers – and increase the presence of micro-flora, a vital component of living soil. The Intergovernmental Panel on Climate Change (IPCC) estimates that agriculture contributes 14% of global GHG emissions, whilst the land use, land-use change and forestry (LULUCF) sectors contributes an estimated further 17%. Emissions of N2O and CH4, which originate from livestock and soil, are nearly 300 and 35 times more powerful than CO2, respectively. 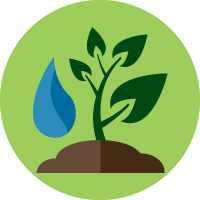 N2O emissions from soils alone constitute around 40% of non-CO2 emissions. Globally, the soil contains about 1,500Gt of soil organic carbon (SOC) which is more than double the amount of carbon in the atmosphere and 3 times that in plants, animals and microorganisms. The cumulative historic loss from ploughing and mining the soil’s humus is between 50Gt-78Gt. 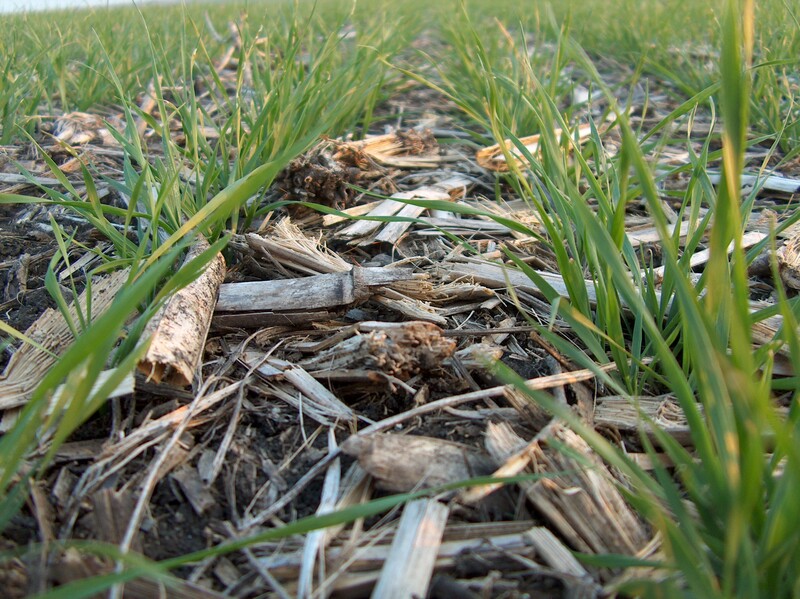 No-till farming combined with mulching leads to the accumulation of soil organic matter (SOM). This process of carbon sequestration, adding more organic matter to the soil, can help to minimise greenhouse gas (GHG) emissions. No-till can result in a reduction of nitrous oxide emissions by 57% compared to tilling. Farmers can choose to keep their crop residues for use as mulch on the soil surface. Alternatively crop residues can provide highly valued fodder for livestock in smallholder farming systems in sub-Saharan Africa. Given the cultural and economic value of livestock, livestock feeding may take precedence. As a result, mulching materials may be in low supply, making the recommended application rates of 0.5-2 tonnes per hectare unrealistic. In some parts of sub-Saharan Africa, farmers cannot restrict general livestock grazing without challenging traditional community rights. If farmers want to keep their residues as mulch, they would need to fence their field, requiring the re-negotiation of traditional agreements governing free grazing, and incurring increased costs for materials and the construction of fences. CA reduces the required labour for crop production by more than 50%. It reduces the need for machinery by 50% on mechanised farms, thus reducing fuel requirements by 70%. Where CA has been adopted, farmers have more time available and often start processing produce or take part in other value adding activities. Although CA generates labour savings by eliminating the practice of tilling, the amount of labour required for weeding may cancel out or outweigh the labour savings gained, unless herbicides are used. Many farmers find it difficult to control weeds when converting from conventional to conservation agriculture, which can lead to farmers giving up on CA and returning to conventional farming practices. Furthermore, a case study in Zimbabwe shows the change in labour allocation from planting to weeding resulted in a shift of tasks such as hand-tillage normally performed by men, to hand weeding that is performed mainly by women. Timely weeding ensures weeds are destroyed before any seeds are produced, reducing the amount of weeds that appear the following season. Short-term benefits such as yield increases often determine the attractiveness of the adoption of any new technology to farmers. With CA, the advantages typically do not appear until the medium to long-term, with the productive benefits accumulating over time. CA’s principles of no-tillage, permanent cover crop and crop rotation halt soil degradation and gradually improve the soil. Sometimes there are short-term reductions in crop yields, which can also deter famers from continuing with CA. Further examination is needed to identify the causes of the short-term reductions in yield and how they can be avoided. Farmers must undertake several major changes to their land management practices that often limit rates of adoption. CA methods also require training and education, which can be difficult to receive. Methods have to be locally adapted to specific farmer resources and agroecological conditions, making it difficult for extension workers to give specific advice in the early stages. Traditional land tenure systems where no individual owns the land reduce the incentives for farmers to invest in the long-term improvement of soil health. Finally, smallholder farmers often lack the capital to invest in this change of production system. To help change the mind-set of farmers who have always tilled the land, community members may be identified and trained to act as a locally trusted source of information, and farmers may engage in participatory research and demonstrations. Extension services may help to improve uptake and support farmers to get through the initial few years when the benefits of CA are not as clear. Food and Agriculture Organization of the United Nations (FAO) 2015, What is Conservation Agriculture? [24 June 2015]. Friedrich, T & Kassam, A 2011, ‘Conservation Agriculture for Sustainable Intensification’ in Società Italiana de Agronomia XL Convegno Nazionale, Università degli Studi Teramo 7-9 settembre 2011 pp.1-4. Corbeels M, Sakyi, RK, Kühne, RF & Whitbread, A 2014, Meta-analysis of crop responses to conservation agriculture in sub-Saharan Africa, CCAFS Report no. 12, CGIAR Research Program on Climate Change, Agriculture and Food Security (CCAFS), Copenhagen. Roose, E, & Barthes, B 2001, Organic matter management for soil conservation and productivity restoration in Africa: a contribution from Francophone research, Nutrient Cycling in Agroecosystems vol. 61, no. 1-2, pp. 159–170. Giller, KE, Witter, E, Corbeels, M & Tittonell, P 2009, ‘Conservation agriculture and smallholder farming in Africa: the heretics’ view’ Field Crops Research vol. 114, no. 1, pp. 23-34. Intergovernmental Panel on Climate Change (IPCC) 2013, Climate Change 2013: The Physical Science Basis. Contribution of Working Group I to the Fifth Assessment Report of the Intergovernmental Panel on Climate Change eds. TF Stocker, D Qin, GK Plattner, M Tignor, SK Allen, J Boschung, A Nauels, Y Xia, V Bex and PM Midgley, Cambridge University Press, Cambridge and New York. Corbeels M, Sakyi, RK, Kühne, RF & Whitbread, A 2014, Meta-analysis of crop responses to conservation agriculture in sub-Saharan Africa: CCAFS Report No. 12, CGIAR Research Program on Climate Change, Agriculture and Food Security (CCAFS), Copenhagen. Wezel, A & Rath, T 2002, ‘Resource conservation strategies in agro-ecosystems of semi-arid West Africa’ Journal of Arid Environments, vol. 51 no. 3, pp. 383-400. Martin, C, Castella, JC, Anh, HL, Eguienta, Y & Hieu, TT 2004, ‘A participatory simulation to facilitate farmers’ adoption of livestock feeding systems based on conservation agriculture in the uplands of northern Vietnam’, International Journal of Agricultural Sustainability, vol. 2, no. 2 pp. 118–132. Abawi, GS & Widmer, TL 2000, ‘Impact of soil health management practices on soilborne pathogens, nematodes and root diseases of vegetable crops’ Applied Soil Ecology vol. 15, no. 1, pp. 37–47. Wall, PC 2007, ‘Tailoring conservation agriculture to the needs of small farmers in developing countries’ Journal of Crop Improvement vol. 19, pp. 37-155. Hartford, N, Le Breton, J & Oldreive, B 2009, Farming for the Future: A Guide to Conservation Agriculture in Zimbabwe Zimbabwe Conservation Agriculture Task Force, Harare. Erenstein, O 2002, ‘Crop residue mulching in tropical and semi-tropical countries: an evaluation of residue availability and other technological implications’ Soil and Tillage Research vol. 67, no. 2, pp. 115–133. From 2005-2006, Concern Worldwide found that 133 farmers practicing ‎conservation agriculture (CA) achieved an average maize yield of 2.8 tonnes per hectare (ranging from 1.03-4.71 tonnes per hectare) whilst conventional farmers in the same area averaged yields of just 0.8 tonnes per hectare. Other reported benefits included reduced labour time and fewer requirements for farm power that lowered input costs, leading to higher profits. Farmers who were previously receiving food aid improved their productivity so much so that they were able to sell grain to neighbouring villages. Farmers also benefited from increased incomes that allowed them to send their children to school, cover medical expenses, and rebuild their assets, such as cattle. 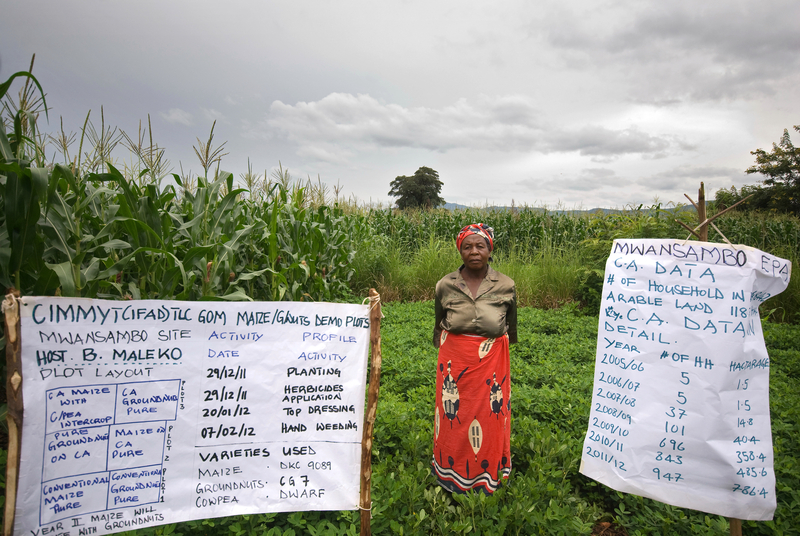 In addition to Zimbabwe, Concern Worldwide has introduced CA—targeting mostly women farmers—in Tanzania, Zambia, and Malawi. Harty, M, Wagstaff, P, Harper, M & Chikarate, J 2010, ‘Conservation Agriculture: Measuring the Impact on Livelihoods in Zimbabwe’ in Agriculture for Development, no.11, eds. G Robertson, J Waller, A Kassam, G Hawtin, D Walton, C Hattam & E Hamer, Tropical Agriculture Association, Edinburgh pp. 20-23. 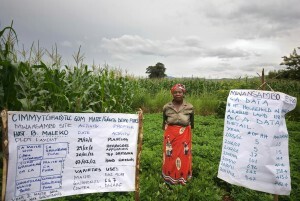 African Smallholder Farmers Group (ASFG) (no date), Conservation Agriculture in Zimbabwe Available from: <http://www.asfg.org.uk/success-stories/conservation-agriculture-in-zimbabwe> [25 June 2015]. Hobbs, B & Powell, S 2011, Healthy Harvests: The benefits of sustainable agriculture in African and Asia, A Christian Aid Report, London. In 2006, the farmers of Rhotia village in the Karatu district of Tanzania made the switch from conventional tillage farming to ‎conservation agriculture (CA). Similar to other smallholder farmers in Tanzania, these farmers suffered from low yields due to soil erosion, a common practice of grazing and removing all crop residues from their fields leaving them bare and vulnerable to the elements, and low use of organic or inorganic fertiliser. In 2004, the Conservation Agriculture for Sustainable Agriculture and Rural Development (CA SARD) project began to teach the farmers of Rhotia CA, a sustainable way of growing crops and managing soil health. The first phase of the project from 2004-2006 used the farmer field school (FFS) approach as a means of teaching CA to 765 farmers in 31 groups across 3 districts (Arumeru, Karatu and Bukoba). The second phase, from 2007-2010, expanded to include another 4 districts, 86 FFS groups reaching more than 3,500 farmers. To start, CA SARD provided training on CA to extension workers, who then facilitated FFS and trained the participating farmers in how to apply CA practices. CA SARD provided start-up assistance to the FFS in the form of field equipment, 10kg of maize seed, and 8kg of hyacinth bean seed and a 1-litre bottle of glyphosate herbicide. Each group tested several CA options depending on their priority problems using different combinations of tillage and multiple cropping of pigeon pea, hyacinth bean, beans or pumpkins. 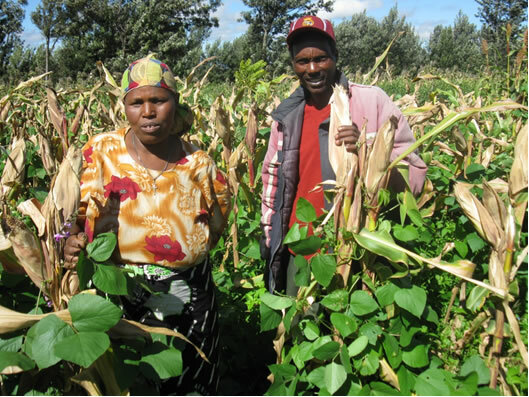 The preferred option of the Mwangaza B FFS group was maize intercropped with hyacinth bean because it generated the highest maize yields (3.75 t/ha), conserved moisture, and controlled soil erosion. 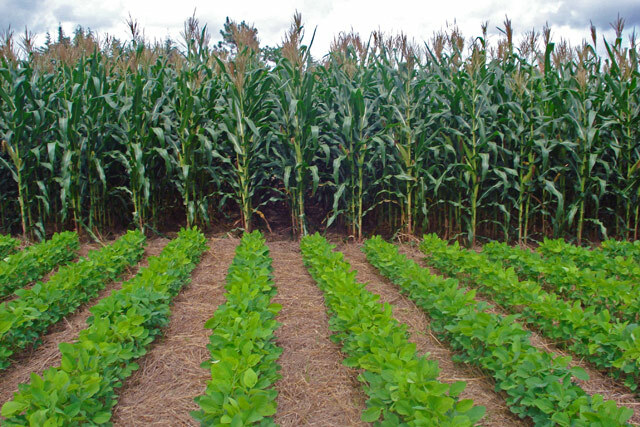 The second most preferred option was maize intercropped with pigeon pea which also produced high maize yields, controlled erosion, high levels of leaf droppings used for cover crops and improved soil fertility. Overall, yields under CA increased from 1.25 t/ha in 2004 to 7 t/ha by 2009. Labour requirements declined, and farmers also benefited from selling hyacinth bean and pigeon pea at a favourable rate of TSH 1,100 per kilogram (approximately US$1). Although the introduction of CA produced significant benefits, these were met with many challenges. The use of crop residue for mulching directly competed with animal feed. With the adoption of CA, farmers stopped selling their crop residues to farmers with livestock and began to prohibit free grazing on their lands. Pastoralists who acquire 80% of their livestock feed from crop residue, especially during the dry season, suffered resulting in conflicts between the farming and pastoralist communities. Additionally, tractor and oxen providers lost significant business when farmers no longer tilled. Mariki, WL, Marietha, ZO, Kassam, A, Kienzle, J, Friedrich, T 2011, ‘Conservation Agriculture (CA) in Tanzania: the case of Mwangaza B CA Farmer Field School (FFS), Rhotia Village, Karatu District, Arusha, Tanzania’ International Journal of Agricultural Sustainability, vol. 9, no. 1, pp. 145-152. Conservation agriculture (CA) is widely promoted as a key solution to climate change adaptation for farmers in sub-Saharan Africa. Slow adoption of the method across the continent, however, has raised questions to its effectiveness and the value of such practices for smallholder farmers. A meta-analysis by the Climate Change Agriculture and Food Security (CCAFS) research programme analysed 41 studies comparing CA with conventional tillage practices across a variety of agroecologies and climate conditions. Although sustainable farming practices like CA are critical to overcome the challenges of changing climates and growing populations, CA may not be the solution for all. By combining no tillage and mulching, yields will increase on average 300kg more per hectare in the first 3 years of adopting CA and even more in subsequent years compared to conventional farming. Though, yields may be lower over the long run if without combining no tillage with soil cover and crop rotation. Further, fertiliser use with CA is an important condition for success. Farmers can yield 400kg more per hectare when applying nitrogen fertiliser in excess of 100kg per hectare. As nitrogen fertiliser use is low across sub-Saharan Africa, microdosing can help farmers to fully benefit from CA. Rainfall levels matter too. Overall, rainfall above 1,000mm results in greater yields on average across the studies. However, in some cases the opposite was also true as heavy rains on mulched soils can induce waterlogging. Despite successes in some reasons, the major reasons for limited adoption is the competition for crop residues. Mixed crop-livestock farmers use crop residues as animal fodder and poor families also use stalks from maize, sorghum or millet as cooking fuel. The returns to various uses for the crop residue must therefore be considered. Further, CA may not suit all soils. CA works better on loamy soils compared to sandy and clay soils. Lastly, crop rotation with nitrogen-fixing legumes has many benefits, but may not always be attractive to farmers if there isn’t a ready market. Paul-Bossuet, A 2014, ‘Does conservation agriculture work for smallholders in Africa? New report highlights key points for action’ 29 August 2014 CCAFS CGIAR: News Blog. Available from: < https://ccafs.cgiar.org/research-highlight/does-conservation-agriculture-work-smallholder-farmers-africa-new-report#.VYXGmELO900>. [20 June 2015].